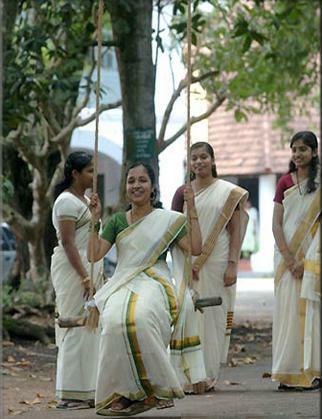 In Kerala, Thiruvathira is a festival primarily for women (although there are other festivals primarily for women, this is the main one). It is celebrated in the Malayalam month of Dhanu (December-January). The popular conception of this festival is that it is the commemoration of the death of Kamadevan; the cupid of Hinduisms mythology. Kamadevan was destroyed in the burning fire of the third eye of Lord Siva; one of the chief members of Hinduisms Divine Trinity. Hence he is now believed as only having a spiritual existence. He is believed to exert powerful influence upon the passions of human nature. In earlier days (and even in some rural areas today), the festival begins as follows. About a week before the festival practically starts, at about 4 in the morning young female members (especially of Nair families), get out of their beds and takes a bath in the local (usually communal) pond. A fairly large number of young ladies get together in the pond for this. They then plunge themselves into the cold water where one of them leads and starts singing a peculiar rhythmic song chiefly pertaining to cupid. The singing is simultaneously accompanied by a curious sound produced with the hand using water. The palm of the left hand is closed and placed just the surface of the water. The palm of the right hand is forcibly brought in a slanting direction over the submerged left hand producing a deep loud noise. This process is continuously repeated together with the singing. When one stanza is over, along with the sound and then the leader stops a while, for the others to follow her in her wake. This continues until the conclusion of the song. Then all of them takes a long pause and before beginning another song. The process goes on until the peep of the dawn, when they rub themselves dry and come home to dress themselves in the neatest and grandest possible (quite often new) attire. They darken the fringes of their eyelids with a sticky preparation of soot mixed up with a little oil or ghee and sometimes with a superficial coating of antimony powder. These days eyeliner is used. They also wear white, black or red marks, lower down the middle of their foreheads close to the part where the two eyebrows near one another, this is known as a ‘pottu’. Traditionally they would chew betel and thus redden their mouth and lips, nowadays lipstick is used. These young girls and ladies then proceed to the enjoyment of another prominent item of Thirvathira known as Oonjal (swing). A long bamboo piece is taken and cut from the root end of it leaving the other end whole, untouched. Then two holes are bored: one on the cut end of each one of the two parts into which the bamboo is split. A small piece of the same, material about a yard in length is divided along the gain in two equal parts. One of these is taken and its both ends are cut into points which are thrust into the holes of the long bamboo piece. This is securely nailed and strongly attached to the long bamboo. It is then hung by a very tight strong rope to a horizontal branch of the neighbouring tree for a makeshift swing. Then the player seats herself on the small piece attached between the split positions which are firmly held by her two hands. The whole thing is propelled upwards by someone from behind. The ladies derive immense pleasure from their process of swinging backwards and forwards, chatting and sometimes singing amongs themselves. On the day of the festival, the women will cleanse themselves in the morning and prepare for a grand lunch to be feasted on at noon. The essential ingredients of it being ordinary ripe plantain fruits and a delicious preparation of arrow-root powder purified and mixed with jaggery or sugar and also coconut. They the spend the whole night singing and dancing. 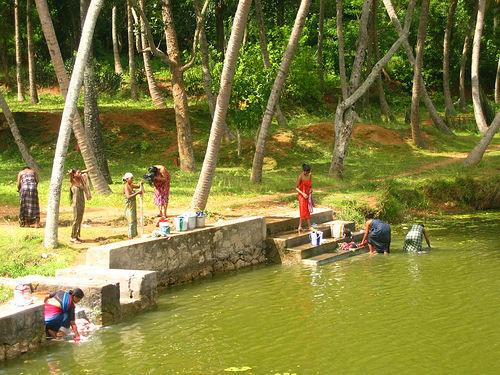 'Ettangadi chuduka' is an important ritualistic act of women. On the day of the festival, eight different tubers are roasted in the fire. Through this ritual, it is believed that Kamadeva's body represented by the tubers is regained. This delicious preparation known as Thiruvathirappuzhukku, a special dish prepared by these tubers forms the main item for lunch. In some places, women spend the whole day taking no food except this preparation. The night long music and dance is interspersed with a ceremony called Patirappoo choodal. It is a ritualistic wearing of flowers at midnight. An image of Shiva is placed in the centre of the courtyard in front of lighted brass lamp where flowers, plantains, and jaggery are offered to the deity. The women perform the dance around the image and each participant adorns a few flowers from the offering and have the arrowroot preparation of puzhukku and tender coconut milk, which are the items of the food. The morning bath during the season while the climate is extremely cold make the women's body cool and composed. Apart from the religious significance of the day, the women of Kerala enjoy good exercise and entertainment on this day. After the midnight, ritual of adorning with flowers, the dance and music continue till sunrise. The participants take their morning ablutions and with it the festival is concluded.